In the end, perhaps worth it (? ), but much of the intended humor doesn't quite connect. Set in 1977, it had the potential for a great soundtrack (think The Big Chill, or Guardians of the Galaxy), but that doesn't quite materialize either. The chemistry between our two angry birds, Crowe and Gosling, is absolutely undeniable. They're adorable together. I could happily envision a string of re-teaming buddy comedies, though I suppose neither actor would be interested in repeating himself, and certainly not via Boogie Nights. Australia's Angourie Rice, just 15, is a revelation; she bursts off the screen and, I'm sure, will be everywhere soon. 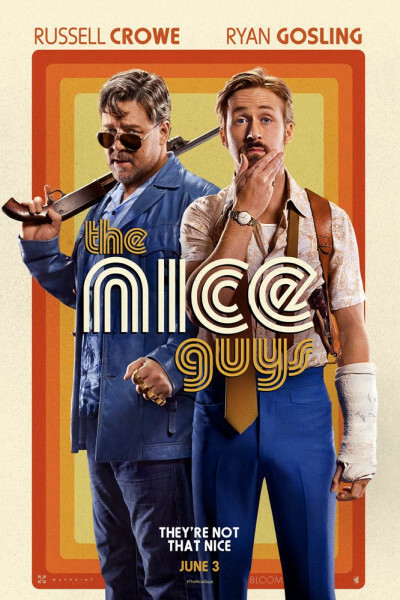 The Nice Guys is a hard-R caper, the plot revolving entirely around an adult cinema serial murders mystery, so don't take the kiddos unless you wanna pay for therapy sessions with one-dollar bills.